This is a Dwarf Korean Lilac bush that is about 6 years old. 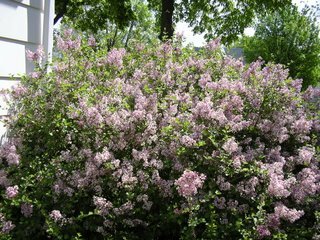 It is just now blooming, after the regular lilacs have spent their blooms. The fragrance is so overpowering that I can smell it through the house as I sit here at my computer. It's pure heaven! The lilies of the Valley are also blooming right now. See? There. 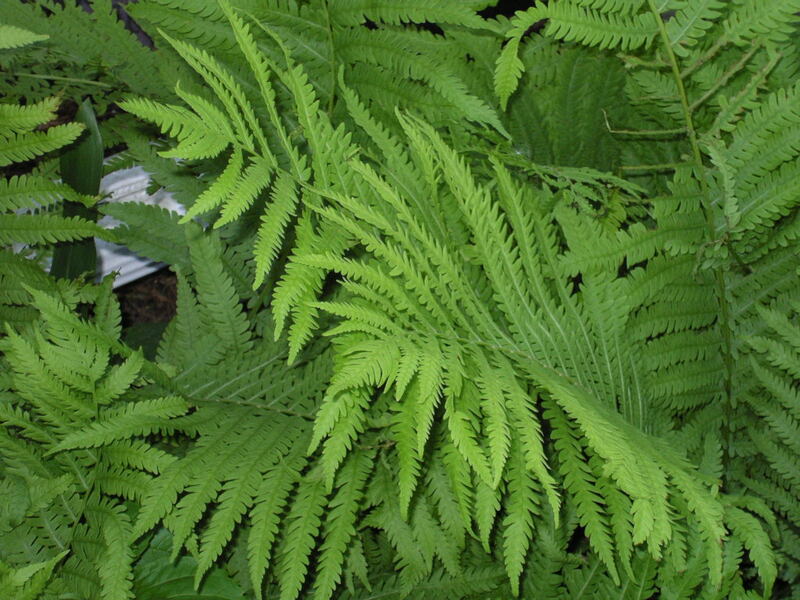 In among the lush ferns? I love their smell. I only wish they bloomed longer. This garden is just so beautiful right now, but by July it will be struggling as the sun is only partially blocked by the house. I've thought about taking them out and rocking the whole place as this is where my watering hose is located. 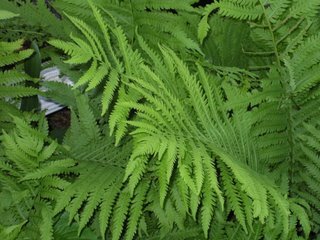 But I just can't stand the thought of not being able to dip my hands in the flowers and ferns and feel their cool, feathery touch if only for a month. 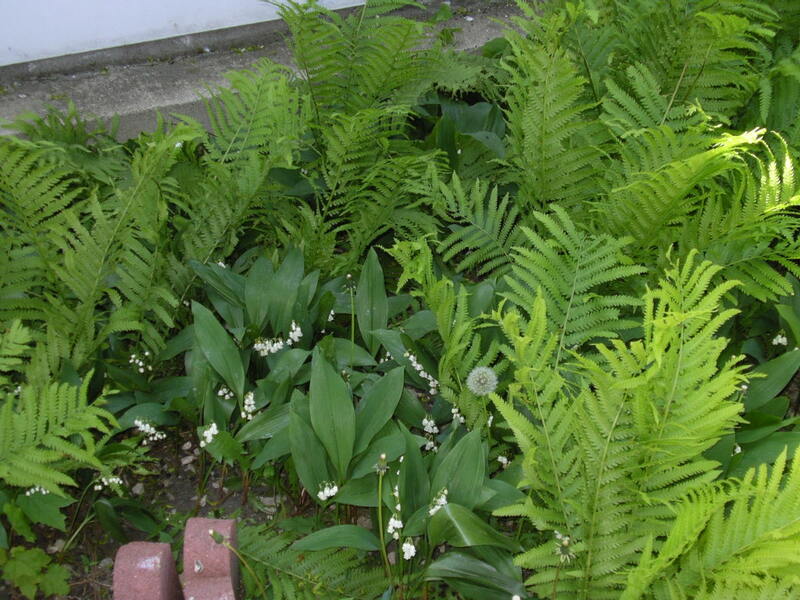 I've tried to transplant some ferns and lilies of the Valley to the north side of the house, but they don't seem to like it as well. I'll just have to be content with their beauty right here. Along with my fern leaf peony I have a regular peony (that isn't blooming at the moment) and some old-fashioned Iris. The plain-jane purple variety that smells like grapes. At least, that's what it reminds me of. As I was trying to take its picture, the wind was blowing the stalk about and the fragrance of the flower filled my senses. Peonies and Irises always remind me of Memorial Day. Mason jars filled with the blooms of just-picked flowers. Plastic graveside flowers were simply unheard of back then. The decorations all came from our gardens. The women would walk from grave to grave admiring the beauty and unusual characteristics of the flowers in their plain glass jars. It was a source of pride for all. The cemetery always smelled of peonies and irises. Even today the old-fashioned irises grow along the banks of the cemetery where the cut flowers were thrown when they were spent and the women came back to claim their canning jars. Oh, sure - the hi-breds are quite the show stoppers, with their frilly petals and their strange, almost garish colors. All flash and no heart. No fragrance. I'll take my plain-Jane purple, grape-smelling, old-fashioned iris any day. Sally, I loved this post! Every time I take Josh to daycare or pick him up of late, I get to smell one of these beautiful dwarf Korean lilacs. They have one that is in a standard form and it is just so gorgeous! 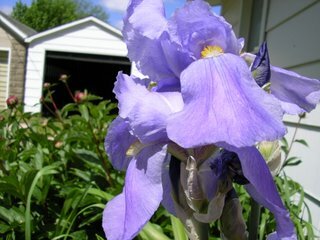 I too, love the old fashioned irises...the ones that smell like grape (kool-aid to me...*grins*). I think I got my hands on some from a friend this year, but he dug them before they bloomed so they won't be blooming this year. Your talk of the old fruit jars full of irises and peonies at the grave sites sure brings back memories. Dad would always go pick Mom some "Sweet Williams"(I belive it is actually phlox) that grew along the cemetery fence when we went to visit Grandma and Grandpa.....now Mom and Dad are both there so I always go pick a bunch from the same patch "for Mom from Dad". Have a safe holiday! What a beautiful roundup of your garden, Sally!